The device is used for decontamination of food and water. ECOFOOD disinfects food, water and household items. The effect of the device is unfavorable for pathogenic organisms. This prevents infection in the human body, provides prevention of many diseases and supports a safe environment. Every day the human body encounters pathogens - poorly processed vegetables and fruits, infected fish and meat, kitchens, bathrooms and toilets, door mats, couches for pets. Chemical disinfectants and detergents are generally used for disinfection. The use of ECOFOOD for disinfection is the most environmentally friendly way to influence pathogenic microorganisms. decontamination and activation of water, removal of harmful chemical and biological contaminants' influence on the body. processing of food (meat, vegetables, fruits, greens, fish, eggs, beverages, etc.) for decontamination, improvement of taste benefits and longer shelf life; neutralization of impact of natural and chemical contaminants included in the food on the body. aquarium maintenance (decontamination of water and improvement of water's quality). disinfection of toilets, bathrooms and working surfaces in kitchens. improvements of seeds' germination and their shelf life through their treatment before storing and sowing. disinfection of cats' and dogs' toilets and their livelihood. Improving the quality of water and food. The device Ecofood includes an electromagnetic field emitter of optic diapason. The field which is generated by the device has essential biological activity. This impact is negative for pathogen organisms. If it is needed to decontaminate food and water, you should add informative matrix of 'Chlorhexidine', and use appropriate amplitude modulation of optic radiation source. Radiation power and parameters of an amplitude modulation of radiation are set, controlled and regulated by the built-in program using a microprocessor. When the device is operating, some of the energy of electromagnetic radiation is converted into a biofield, similar to that created by the functional systems of the human or animal body. According to the experimentally obtained results, the electromagnetic field generated by the device has a sufficiently strong biological activity. Herewith, the present biological effect can be both favorable for the irradiated organism, and unfavorable for living tissues. This depends on the combinations of modulation characteristics and the form of radiation established in the program. The sign (±) of the biological effect and the selection of the parameters, intensity and type of radiation incorporated in the program was carried out empirically (yet the theory of such processes does not exist) using biosensors or biodetectors (cell populations and cultures) or by subjective perception of a human-operator, (for example psychics and biolocation). The biogenic radiation effect of the device can vary quite strongly in the dynamic range, from biostimulating to biopathogenic, depending on the type of pulse modulation of the radiation source. If the radiation of the device passes through a substance, the radiation stream receives an additional specific information modulation containing information about this substance that is carried along with the radiation field on the irradiated organism, food or water. As a result, the body receives an additional and very important biologically active effect. When the device is used to disinfect food and water, "Chlorhexidine" or information matrix of the inactivated strain of the pathogenic organism is inserted into the device and the corresponding program of information modulation of the source of optical radiation is switched on. The ECOFUD device is manufactured with the established matrix "Chlorhexidine". The radiation generator operates at a frequency with a wavelength of 525 nanometers, a radiation power of 500 milliwatts, an active radius of 50 cm to the object of irradiation, two modulation frequencies of radiation: 12.5 hertz and 3.5 kilohertz. The device is small in size 58x105x19 mm, powered by 3 volts from two AAA batteries. 1. Place the device on the back side (without a drawing) of the processed products, water, surfaces at a distance of about 50 cm. 2. Switch on the device by briefly pressing the button. A lighted LED indicates that the device is on. After 20 minutes, the device will automatically turn off. 3. If you need to forcibly turn the device off, press the button and keep it pressed until the LED is off. Attention! 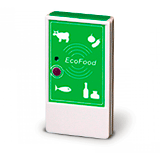 Do not direct ECOFOOD with its back side to the person. ECOFOOD with an information matrix of chlorhexidine is intended only to affect water, food and household items.